Ven. Lhundrup and the students of Shen Phen Ling Study Group, Victoria, Australia, February 2014. Photo courtesy of Shen Phen Ling. 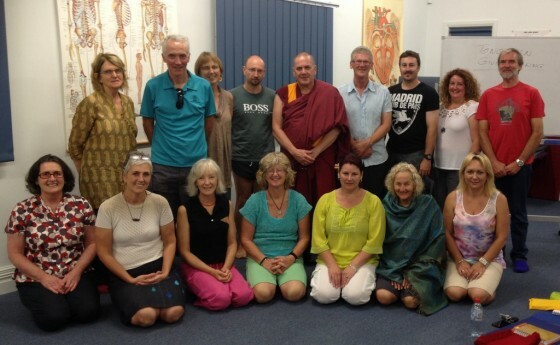 Shen Phen Ling Study Group in Albury/Wodonga has been blessed to have been receiving monthly teachings on Discovering Buddhism topics from Ven. Lhundrup for several years. His willingness to undertake the four-hour drive from Thubten Shedrup Ling Monastery in Bendigo to Wodonga, and an overnight stay each month, is amazing. His dedication to sharing the Dharma with us has ensured the continued existence of our group and been of enormous benefit to us all. Although very sad to see him leave us for the time being, we wish him well for his studies in Dharamsala, India.